Follow all directions when using tire-specific products. 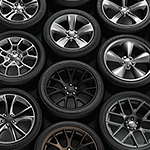 Many of these products have the potential to damage other areas of your vehicle. You could also damage your driveway or garage floor if you let a product like tire gel or tire black sit on that surface for any length of time. Take the time to invest in good quality products that will make a difference.